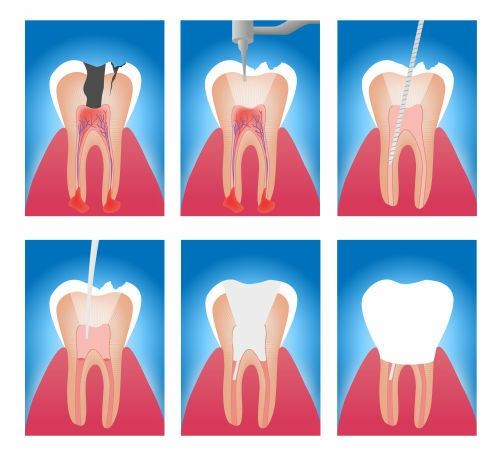 Root canal treatment is a procedure that removes an infected pulp from a tooth in order to save it. Tooth pain and tender gums can be a sign of an infected tooth and should be examined right away. Infected teeth are known to cause pain which worsens when left untreated. But aside from pain, tooth loss is likely to occur. Injury or tooth decay that has been left untreated can cause an infection. Bacteria accumulates inside the tooth from the opening and causes the pulp to become infected. A root canal procedure involves an examination to first identify the issue for the symptoms you are experiencing. Once determined that a root canal is needed, the area is numbed and the dentist creates a hole at the top of the tooth. This allows access to drain the tooth of the infection and remove the pulp. We then use antimicrobial solution to wash away remaining bacteria before sealing the tooth. A temporary filling is used until the tooth has fully healed. Once ready, a dental crown is placed over the tooth to preserve it. Maintain proper dental care. Brushing twice a day and flossing daily keeps teeth free from bacteria buildup. Also, regular dental exams and cleanings help to detect issues like cavities and tooth decay while cleaning the teeth from tartar and plaque. Schedule a dental exam today to learn more about your oral health. If you are experiencing any of the symptoms listed above, please contact us. Call (617) 566-0308 or book an appointment now.